The adventure begins picking the passengers up from their hotel in Uyuni or Colchani. We are going to look for a great spot in the salt flat to appreciate the spectacular view of the salt flat on the sunset. Finally, after 3 hours taking pictures, we return to Uyuni city and leave the passengers to their hotel to have dinner and rest. After their breakfast, we will depart and continue our tour arriving to our first stop Cañapa Lagoon where is inhabited by a great quantity of flamingos and also we can see the highlands scenery. Then, we are going to continue our tour visiting the following lagoons Hedionda Lagoon, Chiarkota Lagoon and Ramadita Lagoon on which you can appreciate many flamingos as in the first lagoon; but they have other kind of features. At 13:30 we will arrive to Fish Island to have our lunch (we have an option to make a barbecue here). We will have time to take amazing pictures in the salt flat during the afternoon. After lunch we will continue the tour arriving to Incahuasi Island. We are going to have a trekking in this place, to see the giant cacti and from the top of this island we will appreciate the spectacular view of the salt flat and take many photos. Then, we are going to visit “Playa Blanca” Ex Salt hotel which is exposed as a Museum. 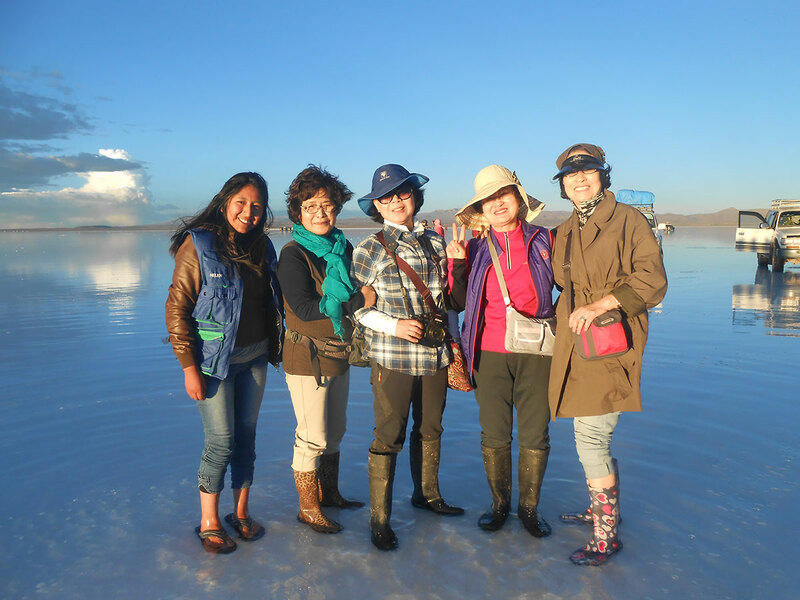 Then, going back to Uyuni we will visit Colchani Village, this is a town that makes its living processing salt, we will visit the micro-factories that refine table salt, as well as the main economic activity is selling handicrafts as souvenirs. Then, we will see salt pyramids which are huge piles and block of salt. Our last stop will be the Train Cemetery to see ancient locomotives. Finally, return to Uyuni and leave the passengers in their hotel. The route to the salt lake is cold, windy and with high solar radiation. During the day it is generally sunny and the weather is pleasant but at night it can get very cold. Do not forget to bring the following items: warm clothes, gloves, wool socks, wool hat covering your ears, towel, lips moisturizer, waterproof clothes in Rainy season (From January to March), extra drinking water and a lot of energy to have fun. CHANGES: It is FREE to change the tour date before 5:00 pm (Uyuni time) 3 days before the tour begins. NO SHOWS & CANCELLATIONS: If you cancel before 5:00 pm (Uyuni time) 3 days before the tour begins, a 10% administration fee will apply. After this time, there is a 100% no show or cancellation fee. Please email booking@fullturismobolivia.com to cancel this tour or make any changes. From where do the tours start - can I start from La Paz? 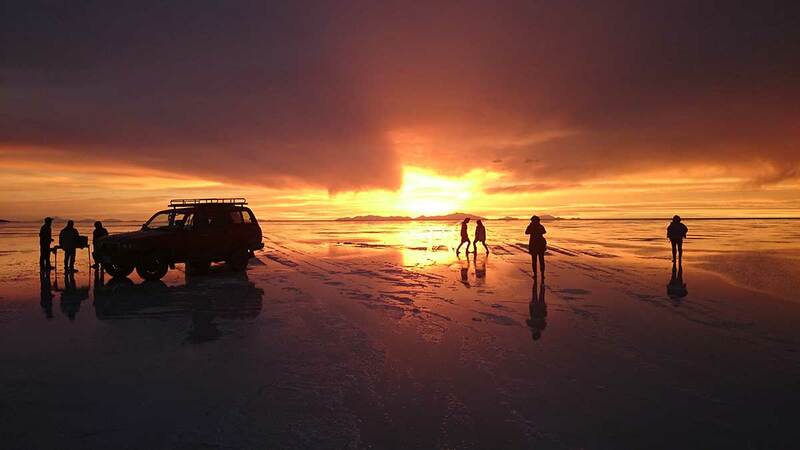 All of the tours of the Salar de Uyuni start in Uyuni. The tours will not include your transfer from La Paz; you will need to organise and pay for this separately. The buses to Uyuni are overnight, departing from La Paz every evening, and arriving into Uyuni the next day at about 7:00am. You are able to start a tour on the same morning, as tours start from 10:00am. We recommend the bus company Todo Turismo, as it is the most well-known among travellers. I heard that I can finish this tour in Chile...Is that possible? It is possible to get a transfer onto San Pedro de Atacama in Chile. On the third day in the morning, after the visit to the Green Lake, the car will take you to the border line, which is 35 minutes away from the Green Lake. Once at the border, the tour guide will help you to swap into a bus. This bus will take you to San Pedro from the border (a 1-hour ride), and you will get to San Pedro by 1:00 pm (Chile time), on the third day of tour. The drop off is at San Pedro de Atacama’s main square. The tour price includes the transfer onto San Pedro. Do I need to stay one night in Uyuni before and after my tour? 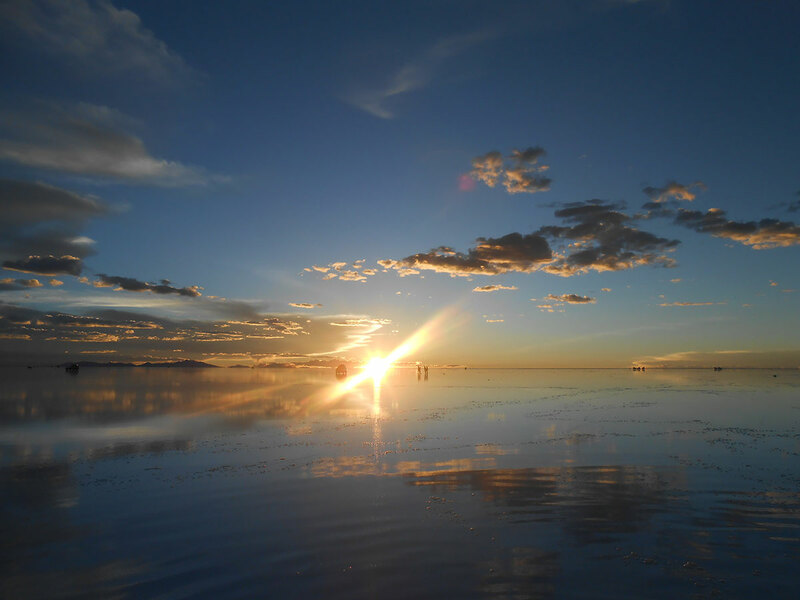 You will arrive into Uyuni early in the morning, so it is possible to start a tour the day you arrive. Most of the tours will start at 10:30am or 11:00am. You will return to Uyuni by 17:30pm or 18:00pm, giving you time to eat and head back on the overnight bus to La Paz, or even take a bus onto Potosi / Sucre. It is advised that you book these buses before doing your tour of the Salt Flats. 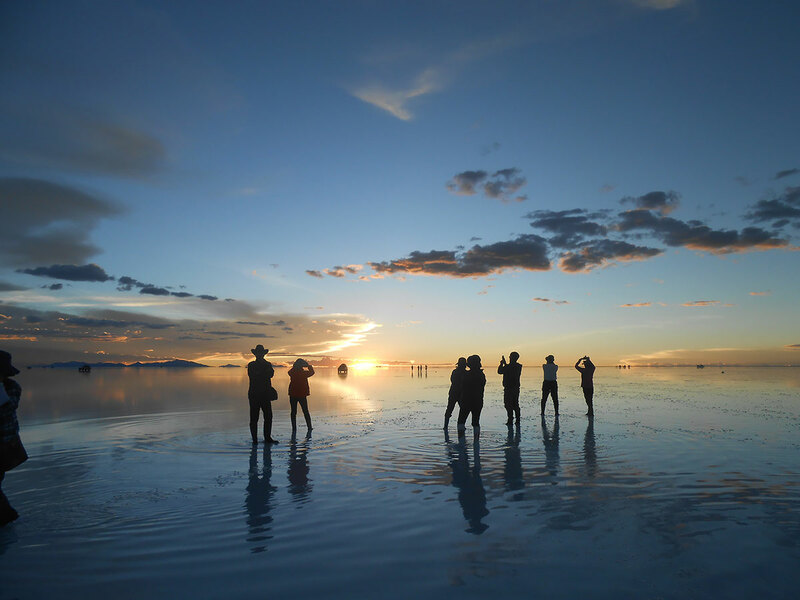 By following this itinerary, it is not necessary to stay in Uyuni. What kind of weather can we find in Uyuni Salt Flats? From June to September, you will find the lowest temperatures. Generally, it is cold, dry, and windy, and can easily reach -15 °C at night. Daytime temperatures can be between 5 and 10°C, and even increase a little more. The temperatures from January to May increase until at a comfortable level, and particularly in the day it can easily reach 19°C. However, the humidity from rain can cause a drop in the temperature. How does the wet season affect the tours? 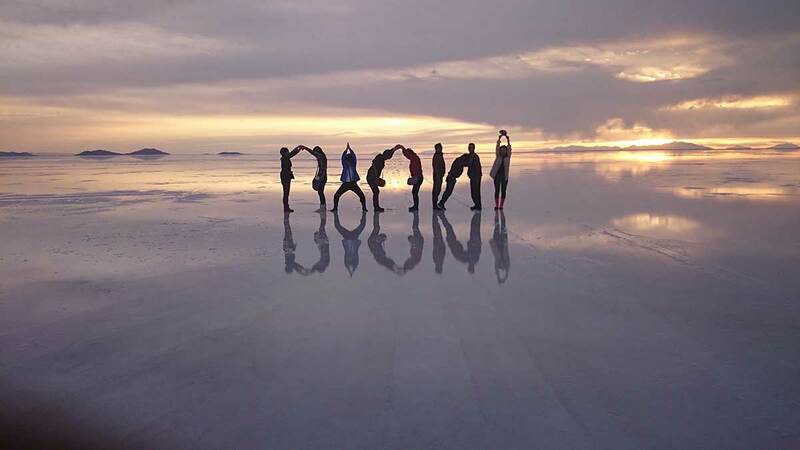 Salt flat (Salar de Uyuni) tours leave year-round, including during the wet season. 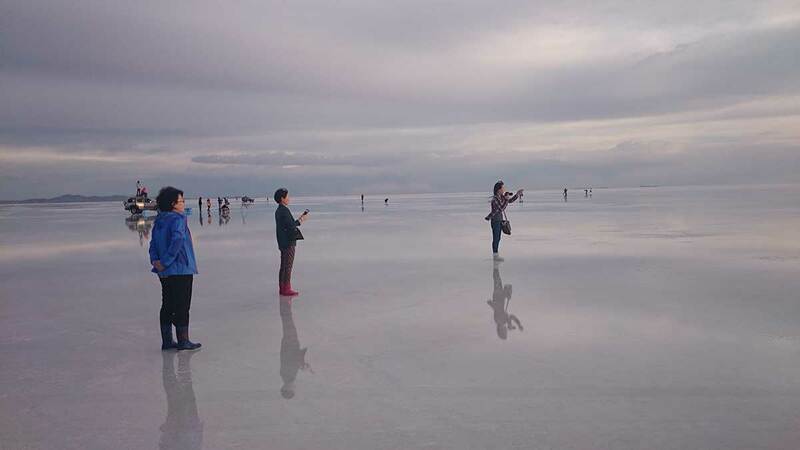 In fact, many people try to visit during the wet season, in order to see the "mirror effect" of the water sitting atop of the salt flats and reflecting the sky, which is an incredible sight. This is caused when the water table below the salt flats has risen enough to cause the water to sit on top of the salt. It is fine to visit the area when there is a certain amount of water, but when it becomes too deep (after long, sustained periods of rainfall in consecutive days) some places can become inaccessible, such as Isla Incahuasi. These must then be omitted from the tours, but we can usually continue visiting other parts of the salt flats. Also, the area to the south (with the coloured lakes, geysers, hot springs etc) is usually not affected, so tours are not cancelled completely. The entrance fees for the attractions will not be covered. On a 3D/2N tour, the cost will be Bs180 in total (Bs150 for the Eduardo Avaroa National Park, and Bs30 for the Isla del Pescado). For the full day tour, the additional fees will be Bs30. Also, if you would like a hot shower on the first night, there will be an additional cost of approx. Bs15. Make sure you bring small change for bathrooms along the way. Bring a torch, because the lights go out when the generator runs dry. Take coins and small bills, as the bathrooms aren't free. Don’t forget sunglasses, a camera with spare batteries, extra water, sunscreen and a hat, a sleeping bag, extra snacks (especially fruit and protein), lip balm (the sun, wind, and dry air will crack them up), and your passport. Take warm clothes (layers are best) for nights, as temperatures can get very low. Bring a t-shirt for daytime use, a jumper for the evenings, a warm jacket, gloves, and woollen socks for the night-time. Also, remember comfortable walking shoes, flip-flops (for shared restroom facilities), a swimsuit, a towel, and a raincoat (for the rainy season, from December to March). Altitude sickness can catch many travellers a little bit off guard. Not everyone gets sick in high altitudes, and it is difficult to predict who is likely to be badly affected by it. For most people, it is nothing more than a headache and a dizzy sensation that diminishes over a short period of time, 1 to 2 days for most people. If you want to limit your chances of getting sick, there are a few things you can do. Firstly, do not fly directly into high altitude - proceed slowly, allowing your body time to acclimatise as you ascend gradually. However, for many that is not possible, so it’s important to drink lots of water, and to slow down! This sounds simple, but both of these things are very important. Your body is struggling because you don’t have enough oxygen, so avoiding any strenuous activity is a good idea. Chew some coca leaves - the native people of South America have been chewing coca for centuries, thanks to its ability to alleviate mild altitude sickness symptoms. Coca leaves can be bought in any supermarket, and even souvenir shops or street stalls. Take altitude sickness pills (Soroche): these are sold over the counter all over Peru and Bolivia, and are just a few dollars. If you are flying straight into altitude over 2500 metres without spending any time at an intermediate elevation, and you’re worried about getting sick, you can ask your doctor for more specific and stronger altitude sickness medication in advance. In the rare case that your symptoms are more severe than a headache and mild dizziness, you should descend in altitude and seek medical assistance. Are there ATMs and an internet connection? Bring money with you, as sometimes the ATMs do not work in Uyuni – it’s best to have money prior to arrival. There is no internet connection on the tour, as the places that you’ll visit are in very remote locations. I have heard and read awful stories about the drivers being drunk, and terrible car accidents happening? We only work with the best tour operators in Uyuni, and they monitor their drivers closely to ensure that there are none of these issues. We know there are many rogue operators in Uyuni with bad reputations, and for this reason we only offer tours with selected operators that we feel we can trust. 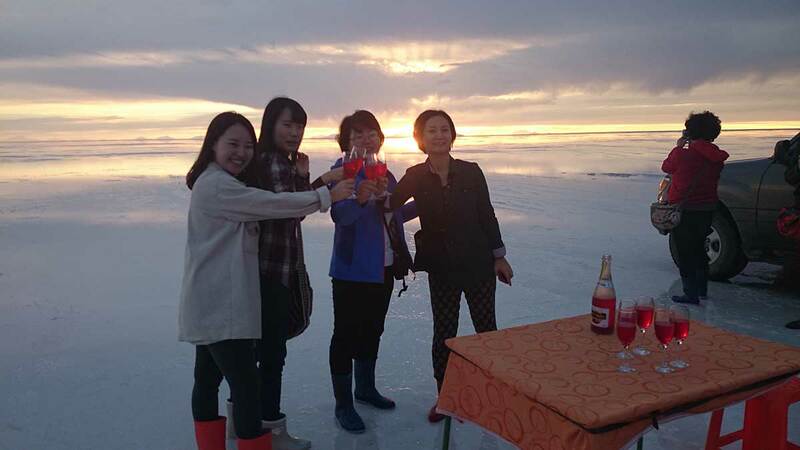 Do you sell any Uyuni Salt Flats tour over the Christmas / New Year period? We do not sell any Uyuni Salt Flats tours from December 23rd through to January 6th because of safety concerns. Specifically, this is due to the high number of drunk driving incidents that occur on Salt Flats tours during this time. We don't sell tours with any tour operator that we work with, and we think it is best to avoid the dangers and problems that occur at this time of year. Can I pay to upgrade my hotels on the Salt Flats tours? No, you can't. Unfortunately, we do not offer the option to upgrade accommodation because this would involve separating groups to different areas, and it is considered as a private tour by the tour operators. Where I will be staying in Uyuni for the 2 nights? On the first night, you will stay in a salt hostel called "Nuevo Amanecer" in Atulcha, in a 4 to 6 bed dorm. Each dorm has a private toilet. If you want to take a hot shower, the price is 10 Bs per person. On the second night, you will stay in a shelter point called "Efames" in Polques, in a big dorm for 5 to 6 people. You will need to use a shared bathroom. Apart from our low-price guarantee, with us you can be 100% assured that your booking is made. 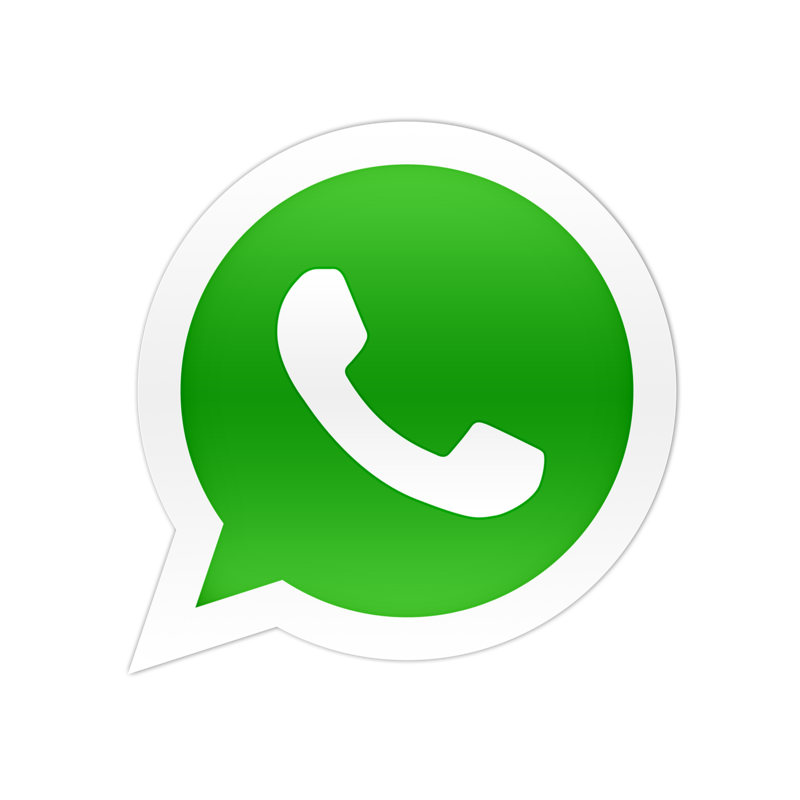 We provide instant email confirmation, and have live spaces and availability for each tour. You are in the capable hands of our team here on the ground, with 20 local experts who speak perfect Spanish and English, always ready with a quick response to any of the questions you might have. Tour operators are experts at operating their tours, and we are the experts at reservations, organisation, and assistance with your plans for these tours. I do not want to take all of my belongings with me to the Salt Flats. Where can I leave my big bag or suitcase? The first day of your tour you can leave your belongings at the Red Planet Expedition's office, and pick them up on return. I am interested in ONLY SUNSET TOUR ！ PRIVATE TOUR - BO-UYU-01 how much does it cost? Address: at 190 Juan XXIII Alley. Between Illampu and Linares St One block from Sagarnaga St.
Copyright©2017 JPE. All Rights Reserved.